What is a picture perfect moment? It's all the imperfect seconds between looking at the camera lens, when you chuckle at your spouse smoothing down a cowlick, when your son decides it's the perfect time to pick his nose and show it off to the world, when your daughter prances around in her new red glitter mary janes, or when the baby just can't stop giggling to the rattle of her toy maraca. Families are dynamic in their own ways. It's important to document them just as they are; funny, unexpected, imperfect, sometimes-chaotic-but-always-beautiful and pure. From a newly engaged couple and eight-day-old newborns to hysterical toddlers and adoring grandparents, I strive to create unique and memorable images for my clients that reflect the essence and personality of each family. 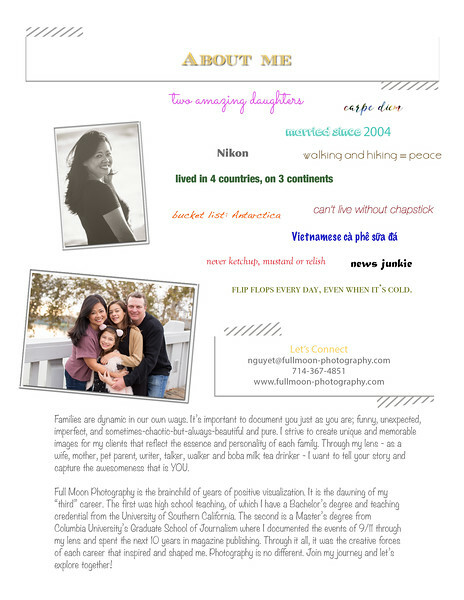 Through my lens – as a wife, mother, pet parent, writer, talker, walker and boba milk tea drinker – I want to tell your story and capture the awesomeness that is YOU.